The Samoa Institute of Sport (S.I.S.) celebrated the success of their Netball Academy athletes during a leadership development retreat held at Fiafia Village Beach Fales, last week. Athletes on the programme were members of the teams that placed second and third in the A Reserve grade of the P.F.L. National Club competition. What is exciting isn’t the fact that the average age of athletes involved is 15, but that the vast majority have never played at national club level before. So what has been the formula behind their success? According to head coach, Ruta Tonumaivao-Schwalger, it is about creating a culture of excellence and supporting young athletes to transfer their on-court success into their studies. The S.I.S. 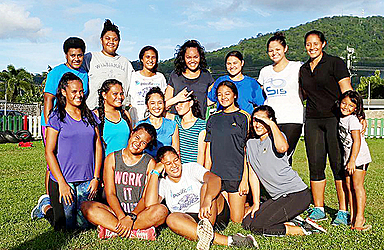 Netball Academy programme is led by Tonumaivao-Schwalger and Philippa Te Hira-Matatia. It has attracted over 40 athletes from local secondary schools since starting in April 2017. Athletes are trained by a team of coaches twice a week at the Marist Sports Club Lotopa, helping them get a taste of the rigours of elite training. “Our goal is to build strong pathways for athletes to progress from the developing stage in to the elite level. 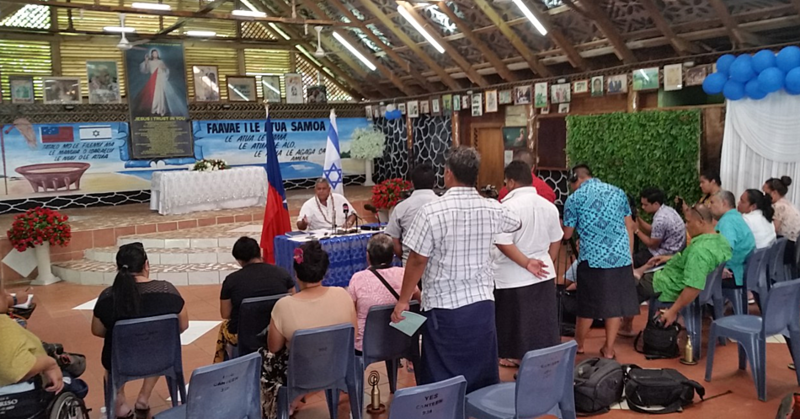 Samoa has an abundance of raw talent and we want to help nurture and develop a pool of locally-based elite players,” shares Tonumaivao-Schwalger. As well as providing a breeding ground for local talent, the programme also mentors and supports coaches. Eka Arp first joined the program as a way to give back to youth and has found it to be an enriching learning experience. “I have learned so much about coaching, game strategies and most of all, team building. These girls have lifted me, as well as the head coaches, who we have learned so much from.” says Arp. One of the academy athletes is Rosanna Bell, a Year 13 student from Wesley College. Hailing from the village of Faleasiu, Bell and three of her classmates make the journey to Lotopa and back home, twice a week. This is Bell’s first year competing in the national club competition and like her peers, her skills and fitness level have improved remarkably since joining the academy. Bell’s mother has also noticed the off-court benefits of being part of the academy. Moanalua Auva’a, a student from Robert Louis Stevenson Secondary School, is a team mate of Bell. Her passion for netball led her to join the academy and her goal is to one day represent Samoa. Moana’s mother supported her daughter to join the academy as she felt it would be a great opportunity to progress in to elite level competition. “I’ve noticed a big improvement in attitude towards training and she enjoys playing lots of different positions, as well as making new friends with the group of girls she is with,” says Mrs. Auva’a. Since launching in late December, S.I.S. has been engaged in a range of activities to support the development of local sports talent, and the pace doesn’t appear to be slowing down. While the Netball Academy programme shifts gears to prepare athletes for the upcoming national trials, S.I.S. hits the start button on their U12 programmes, beginning with netball and basketball. S.I.S Director, Falefata Hele Matatia, believes his team is up for the challenge.